SAN JOSÉ, CA—“Billy Elliot” the musical, that won ten Tony awards and ten Drama Awards including “The Best Musical” in Broadway, is a work that focuses in two crisis: one crisis is social in character, the other one familiar. In the musical , these crisis come head on in l984-l985 during a miners strike which took place in County Durham, North East England. When the social crisis occurs in this small coal miners town, the results are devastating because the strike threatens the well being of all the miner’s families. Since the men are not working, they are now unable to support their starving families. There is also unrest all over the town: fights between the striking miners and the “scabs” (those who refuse to strike) fights between the police and the striking miners, property damage, and even deaths of civilians, police and miners. The personal “crisis” centers in a miner’s home, around an 11 years old boy by the name of Billy, the son of a former boxer, who instead of boxing prefers to dance ballet. So, in the midst of all the hopelessness, in County Durham, there is one boy who has hope in his dream and whose hope. like sunlight, spreads out into its spectrum of colors and builds a rainbow into the stormy sky. With a score written by ELTON JOHN and book and lyrics by LEE HALL, the screenplay writer of the BBC film of the same name loosely based on “The Stars Look Down” the novel written by A.J. Cronin in l935, it is only befitting that “Billy Elliot” the musical, starts with a song by the same name. This version begins the evening of the strike, with Billy (NOAH PARETS), listening to news on his portable radio, sitting on the floor of a gym. One by one, the members of the National Union of Mine Worker start entering to the Gym singing The Stars Look Down a in which they promise to solidify in a strike, and fight. The scene changes to Billy’s house with Billy’s father telling him that he has been enrolled in a boxing class. Billy attends his boxing class, but he is so bad at boxing that on his first try he gets hit by the other boxer boy and falls on the floor. When he is left inside the gym to continue practicing, he ends up in the the ballet class, which meets at the gym after his class. Mrs. Wilkinson (JANET DICKINSON the teacher, thinking that he is a ballet student, starts instructing him in how to do the exercises. On opening night, the production started on a low key with the cast opening number lacking energy. Also at the beginning of the play, the English slang, was very difficult to understand. As the night progressed, however, both the acting and the speaking got better. BILLY ended with a standing ovation. Because the demands of the role, the production uses different boys to play Billy on different nights Our Billy, was NOAH PARETS, who sang with a lovely voice, was athletic in his gymnastics, which included jumps and tumbles, Rhythmic in his tap dancing and danced his ballet well. His overall acting that night was convincing, but he may have needed more passion singing “Electricity” (the song in which he describes to the judges the freedom that he experiences when he dances) and more energy into his audition dance. VANESSA RUSSO the Dance captain of the National tour gave the audience in BILLY creative dances that night, all of them synchronized. The only one that may need a change in choreography is the assemble dance in which the police and the miners are attacking each other with the dancing ballet students sandwiched between the two groups. As presented, people laughed, thus trivializing a strike that happened, and sadly, had catastrophic consequences in the U.K. for the miners. As Mrs. Wilkinson, Billy’s ballet instructor JANET DICKINSON was very natural. Stern, when as his teacher she needs to be stern with Billy and yet loving when she senses that the lad needs a hug. As Grandma, PATTI PERKINS showed little feeling in her acting. And because in this version the part of Tony’s (CULLEN R TITMAS) was cut, we did not have a chance to see his antagonism towards Billy his younger brother. We ought to remember that Tony is a miner, so dancing is not a profession he considers manly. Dad, (RICH HEBERT) went through his variety of moods as union member, disappointed father, and then unselfish father after realizing the potential in his child, very naturally. 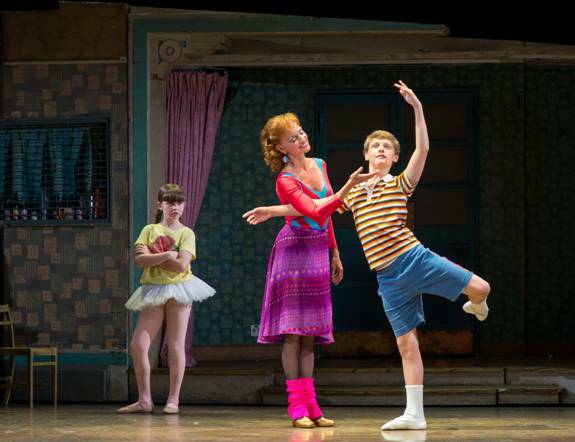 According to Sir ELTON JOHN, the score composer, BILLY ELLIOT is one of his favorite works. It has a touching story, and on that night, it touched everybody’s heart.